Our favorite 8 Step Sequencer with lots of extra functionality! Compact, but incredibly musical sequencer / quantizer / arpeggiator - you name it! 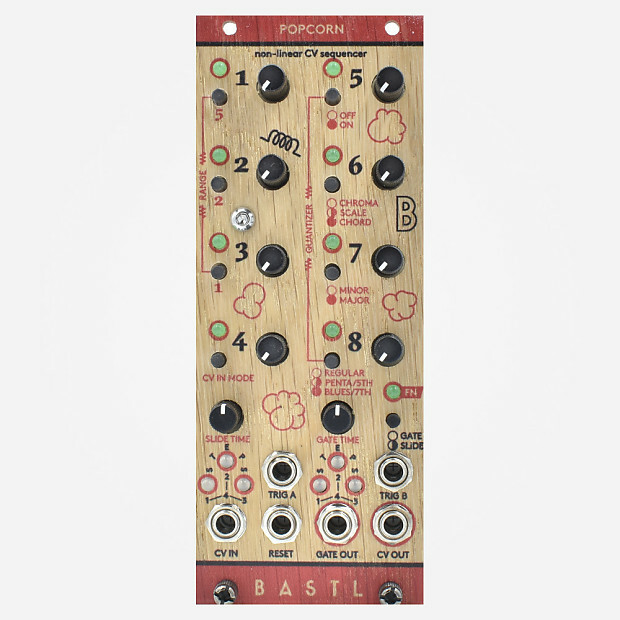 Popcorn sequencer embraces the idea of making selection of 8 notes that can be browsed in many different ways. It all just depends on the signals you feed it with. It is incredibly musical when used with rhythm sequencer such as Knit Rider because it has two triggers A and B which will go 1,2,3, or 4 steps forward or backward depending on the settings of the dedicated knobs. You can also address the steps with CV or 3 binary gates. You can use CV to transpose the pitch or transpose it in a quantized way or change minor major settings of the quantizer with gate. Based on purchase price of $289 at 10% APR for 12 months. Excludes tax and shipping fees, to be calculated at checkout. Rates range from 10-30% APR. Choose from 3, 6, or 12 monthly payments.